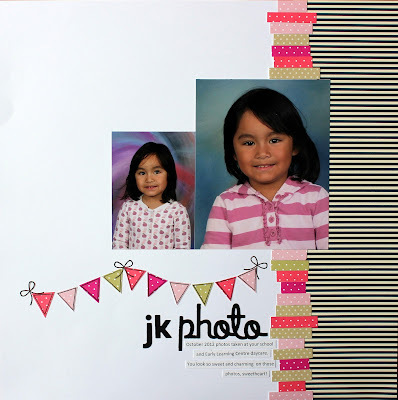 I have a layout to share showcasing the portrait photos taken at my DD’s school and daycare last fall. I decided to put some of them in a layout because I know I will lose them otherwise. I am also reserving one copy of the photo for a future layout I plan to make when she is older which would have all her portrait shots in chronological order. It would be nice to see how she has grown over the years (not that I am in a hurry for her to grow up or anything, but just wanted to have something handy). Here it is... I love how the black stripes create some interest on an otherwise clean and simple layout. I used Papertrey’s alphabet dies (modern and script), one of the Heart to Heart sets for the banner and various bitty dot patterned paper. The striped paper is from MME. I am also linking this to Leigh Penner's Pages with Papertrey challenge on using 3 dies in a layout. Super layout, Irma. The striped paper is a great choice and the banners are such a sweet accent. Lovely layout, Irma! You are rocking the challenge this month!